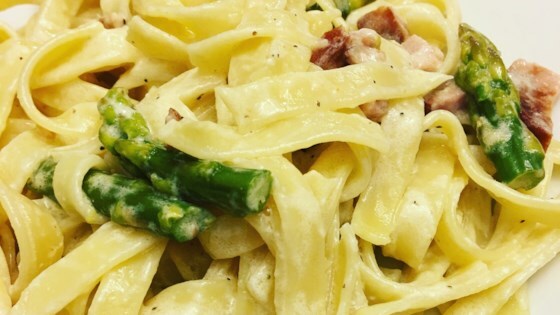 "I LOVE fettuccine, and when made with a bit of leftover ham it takes on a heartiness and richness so filling there isn't room for dessert!" Bring a large pot of lightly salted water to a boil. Add pasta and cook for 8 to 10 minutes or until al dente. Stir asparagus into pot in the last five minutes of cooking; drain. While pasta is cooking, heat butter and cream in a medium saucepan over medium heat. When mixture begins to bubble, stir in Parmesan, garlic powder, pepper and cayenne. Continue cooking until mixture thickens, stirring occasionally. Stir in ham and heat through. Toss pasta and asparagus with sauce and serve immediately. Excellent and easy. Made variations many times. Can substitute Broccoli for the Asparagus. Can substitute Chicken or Shrimp for the Ham. Very good. I used skim milk (thickened with flour) instead of cream. I had made some chicken stock. so I substituted the cooked chicken for the ham. Also added some mushrooms and onions. Used 1% milk and thickened with a little flour. Wonderful! This was great. Even my picky 5 yr old thought it was good. This is a keeper.